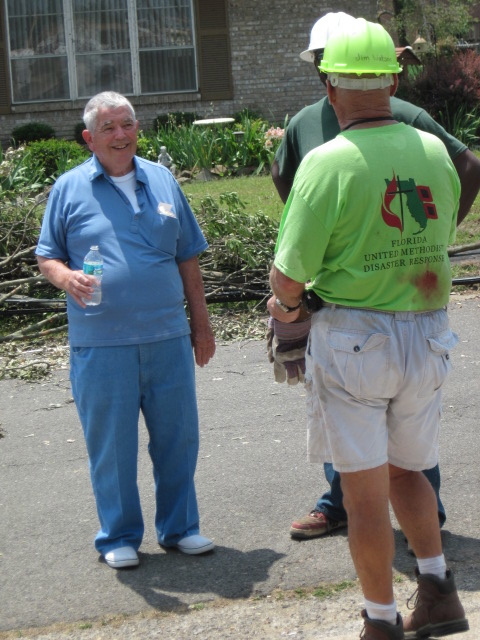 The mission of Disaster Recovery Ministry is to resource and equip local United Methodist Churches and districts as they assist their communities and individuals to prepare, respond and recover from disaster. The goal of the Disaster Recovery Ministry is to effectively manage the resources available to our churches when disaster strikes: information, supplies, volunteers and financial assistance. Disaster Recovery works closely with the local church, the district, local emergency management and other responding organizations and agencies to ensure clear lines of communication and effective coordination of resources. The United Methodist Committee on Relief (UMCOR) is our partner, providing expert guidance and training related to disaster planning, preparation, response and recovery. United Methodist Volunteers in Mission (UMVIM) are also our partners providing training and guidance in volunteer management as well as trained volunteer teams - from both inside and outside the conference -- to work in disaster. The Florida Conference, UMCOR and UMVIM are NOT “first responders” in the event of a storm or other disaster. First response is the responsibility of the trained professionals — firefighters, police, EMS and other county, state and federal personnel. Once the first responders have given the okay, the Disaster Recovery Ministry deploys trained volunteers and volunteer teams to begin the relief process of cleanup and debris removal, as well as information and referral, spiritual care and, eventually, the more challenging process of long-term recovery. As the body of Christ, the church is there with diverse people in many settings to offer loving, compassionate support throughout the recovery process.